I know, you read those prediction articles. Wild stuff. "In 2014, more commerce will be done on Twitter than via email marketing". Nobody is held accountable - folks get page views, readers have fun, authors have fun, your sales remain flat. Do you understand just how important merchandise is to your business? Besides you, I'm not certain anybody else gets it. We're optimizing large green buttons instead of small turquoise buttons, 40% off plus free shipping instead of 30% off plus free two-day shipping, and making sure creative looks identical across all channels so that we can achieve omnichannel excellence. When is the last time a customer told you that they bought from you instead of Amazon because your creative looked the same on a phone as on a laptop? Be honest. Think about this. Merchandise, based on who you ask, counts for anywhere between 60% and 75% of the success of a business (about 70% is the average, when you ask folks), with marketing at about 20%, and creative at about 10%. And yet, all anybody talks about is how to get an extra 5% out of the 20% that marketing is responsible for (hint - 5% of 20% is 1%). Meanwhile, getting an additional 5% out of merchandising strategy is worth 3.5% to the business. Where should you spend your time? Where does everybody else spend their time? Make a resolution for 2014 - resolve to spend the "right" amount of staff time on Merchandise strategy. I'll predict that your business has a better chance of success if the focus is on merchandising strategy. In 2014, I'm beginning a new feature, offering answers to real and imagined questions. Email me (kevinh@minethatdata.com) your questions, and I'll feature them in this weekly series. We'll get things started this week with questions from Twitter. Our first question is from Jason: "Why do you have contempt for social media, and in particular, engagement? What could possibly be wrong with creating interest for the brand, for free?" I have contempt for wasting company resources. Think of it this way. You pay $4,000,000 dollars a year on paid search. For that, you get 8,000,000 clicks (that's a lot of clicks), and a whopping 12,000 orders, at $100 each, netting $12,000,000 in sales, and at a 40% profit factor, $800,000 profit. Tell me what you get for "x" points of engagement? You create great content, and 22,000 fans spread the word. Ok, that's good. And those 22,000 mentions get re-tweeted 10,000 times, so that counts for even more engagement. Fine. Now tell me what I get? The paid search employee is being paid $70,000 a year to generate $800,000 profit. The social media engagement expert is being paid $70,000 a year to generate 1,243,083 engagement points. That's what is wrong, folks! Let's pretend you work for a major retailer ... a billion in annual sales. Let's say your attribution expert can only find 0.2% of sales that are attributed back to social media. That's puny, sure, but it's relevant. Why? Because $1,000,000,000 * 0.002 = $2,000,000 annual sales, and at a 40% profit factor ... it's $800,000 profit. Oh oh! The social media engagement expert actually contributed, and in a major way - the amount of profit is identical to that generated by the paid search expert. Now that's ok, isn't it? So, yes, I get terribly frustrated with lazy work. I have respect for hard work. And when you do the math, for a major retailer, social media pays off. Just do the hard work, folks. Our second question comes from Kyle: "Kevin, what is the best promotion to offer a customer, free shipping or a percentage off your order?" Obviously, you test the tactic that generates the most profit for your business. Here's a more important question - why must you offer a promotion to get customers to purchase your merchandise? Why don't customers love what you sell? Why won't a customer pay full price? Customers pay full price for iPads, don't they? 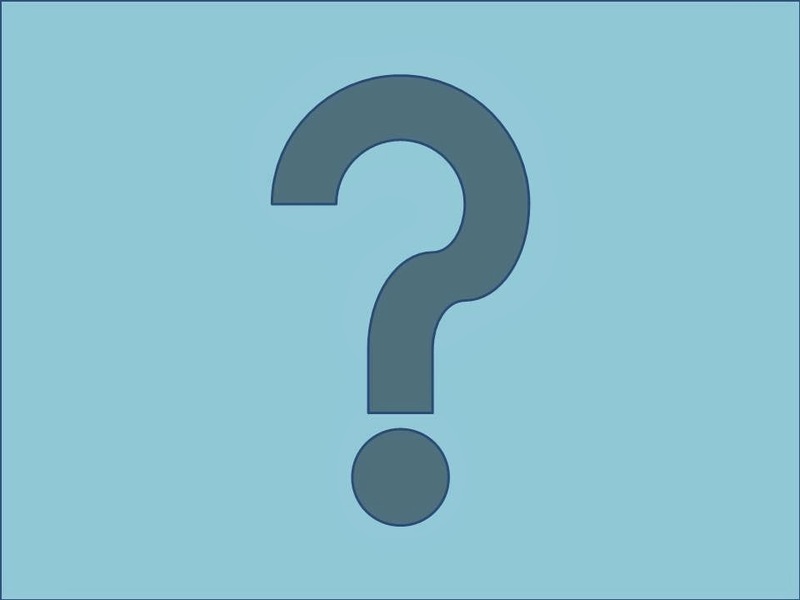 Our third question comes from Tyler: "Kevin, why are you so pessimistic about the future of cataloging? So what if the USPS raises rates? The catalog industry has survived an endless litany of postage increases over the decades. Why so pessimistic when our core customer loves catalogs?" The key phrase in the question is "core customer". Our problem is less a USPS problem than a problem of demographics. The core customer is aging so fast that it is terribly frustrating to me. Terribly frustrating. Those of you who read this blog send emails to me, telling me that Abacus says your core customer is 61 years old. Oh my goodness. It wasn't always like that. All the data I look at tells me that the customer spends 2% to 5% less per year as the customer gets older ... so if the USPS increases postage down the road by, say, 10%, then the actual cost of a mailed catalog goes up by 4% (+/-). So you have a 4% productivity hit, and a 4% cost increase, requiring you to find an 8% merchandise productivity increase to offset demographics and cost increases. And you'll need these merchandise productivity increases, in perpetuity. We can face this problem head-on, or those of us in our mid fifties or older can try to survive until retirement. My fear is that the latter is happening, with younger staffers leaving in droves, going to work in Jennifer/Jasmine-centric businesses. Where does that leave a classic catalog business? That's why I am pessimistic. Our final question comes from Heather: "What do you think of iBeacon or other in-store tracking devices?" Read this little ditty (click here) about music. In the pre-mobile world, the artist released a CD with ten songs, of which between one and three, if lucky, became popular. Now, with music streaming on a mobile phone, the goal is to find a mega-winner and ride it for a long, long time. Or we have movies, where the number of movies are being reduced, but the ones being released are mega-winners that generate a ton of profit (click here). When we think about mobile, we think about "omnichannel", and all the nonsense that comes with integrating channels for a theoretically magical customer experience. We should be thinking about MERCHANDISE! What is happening, of course, is that mobile is splitting us into two kinds of companies. Long-tail brands like Amazon, or even department stores like Macy's. Everybody else, who, in order to succeed, are moving toward a small number of winners that disproportionately carry the success/failure of the business. This business model, being forced upon us by a mobile experience where almost nothing can be featured on a 5" screen, is very, very risky, especially when new item development is poor. Analyze your own data, over the past ten years ... you'll see this trend evolving, happening, being forced upon us. 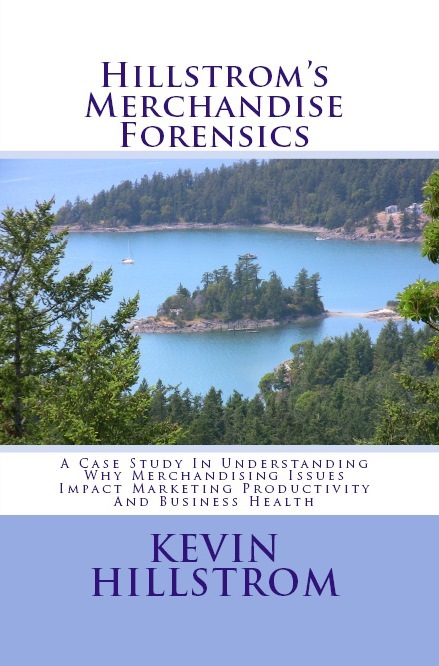 Contact me for your own Merchandise Forensics analysis (kevinh@minethatdata.com). Here's your Christmas gift - Gliebers Dresses - Shark Tank Edition! (Click Here). What happens when Roger Morgan and Glenn Glieber attempt to pitch their business to the Sharks on ABC's popular show, Shark Tank? Find out (click here)! I get a lot of questions about discounts and promotions. Let's illustrate with an example. 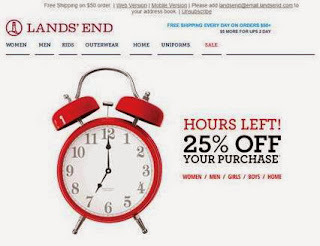 About ten days ago, I received this email promotion from Lands' End at about 6:00am. Hours left to get 25% off of my purchase. Ohhhh, the pressure. I better act, I better act!!! Then look at what shows up around 8:00am, two hours later. When I shared the information on Twitter, I received an interesting reply. 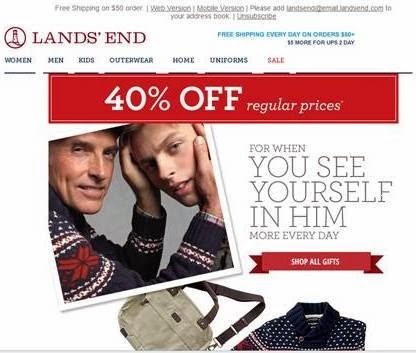 "The problem isn't the discount, the problem is that the CRM team at Lands' End let you see both email campaigns. Smart companies only let you see one." Ok, we've spent three weeks talking about Attribution Simulations. The benefits are obvious, there's no arguing that. And your current attribution vendor is highly unlikely to incorporate attribution results into a five year forecast, allowing you to simulate how different marketing channels impact the future health of your business. So, I'm going to make the latest version of Attribution Simulations available to my clients, and make it available to the vendor community. Cost = $29,000, regardless of business size. Contact me now (kevinh@minethatdata.com) to get your Attribution Simulation started. Contact me for the price (I expect to sell about eight of these things a year, to give you an idea of my sales potential - imagine what your sales potential might be) ... I will teach you how I create the simulations, soup to nuts. Your job is to convert the Attribution Simulation into software that your clients can use. I get to keep creating Attribution Simulations for my current/future clients, you get to sell the tool to your current/future clients. Contact me (kevinh@minethatdata.com) for additional details. If you are a catalog co-op, or database provider, then this solution is right up your alley. Heck, the simulations typically demonstrate that catalogers under-invest in new customer acquisition - the simulation will help your cause more than it will help clients (well, it will help both, no doubt). Exclusive Use ... I will accept bids through January 15 ... if you submit the highest bid (contact me at kevinh@minethatdata.com to learn the minimum bid amount), you get exclusive use of the Attribution Simulation ... no other vendor will be allowed to purchase the educational process from me. But, again, bids will only be accepted through January 15. I think we all agree that the combination of Attribution algorithms and a futuristic Simulation framework yields something that any CEO / CFO / CMO would love to use. Let's get busy using Attribution Simulations! First - if you have a few dollars left in your budget for 2013, and you're looking to burn 'em before December 31, why not burn them with me? Click here for project costs and file formats (here) --- heck, Hillstrom's Health Index is less than $5,000, if funds are tight. If you have less than $20 left in your budget, why not buy one of my booklets from Amazon (click here)? Second - are you in the Atlanta area? I will be in Atlanta on January 30. Email me (kevinh@minethatdata.com) if you wish to discuss a project - the schedule on these visits fills up quickly, to contact me now! When I run Attribution Simulations, I have to estimate how incremental ad dollars will impact future demand. In other words, if I increase my email budget by 50%, how much will total demand attributed to email increase by? 5%? 25%? 50%? Any Attribution Simulation that forecasts five year volume require a series of assumptions. Look at the blue line in the graph. 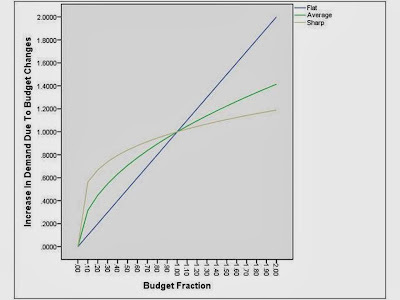 This curve assumes that each dollar spent yields a linear and consistent increase in attributed demand. Look at the green line in the graph. This is the most common outcome - each incremental dollar spent yields less volume, in accordance with a law of diminishing returns. The brown line in the graph is what we typically see in email marketing - one campaign a week gets you most of the benefit, with marginal benefit observed with increased campaigns each week. I typically use power functions in my Attribution Simulations, though you are welcome to use any curve you like, as long as the curve represents reality. 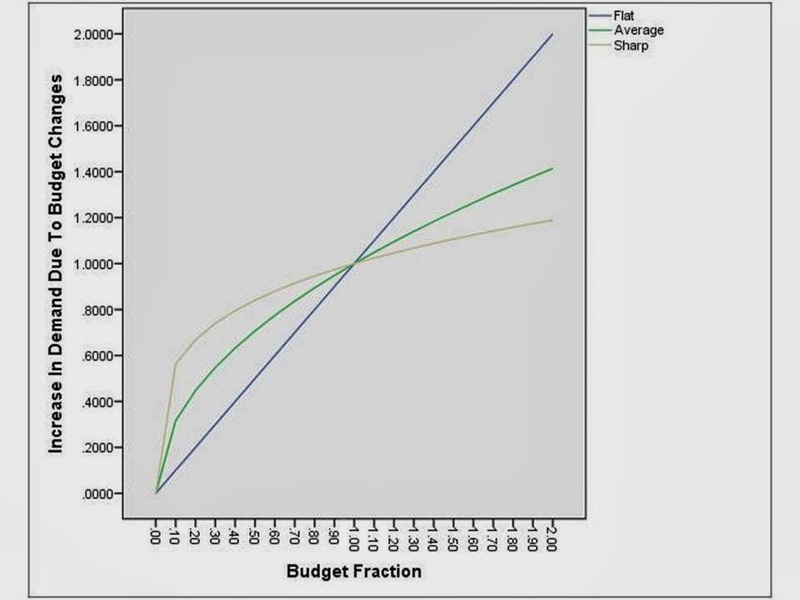 The magic of any Attribution Simulation comes from the advertising curves built into the simulation. The advertising curves are the secret sauce, folks. In your typical attribution discussion, there is considerable consternation regarding first-click and last-click attribution ... and everything in-between! Honestly, most of the talk is theory. Everything, and I mean everything in attribution is wrong. And that's ok. Since the vast majority of my clients use a hybrid of matchback (first-click) and last-click attribution, I calibrate my simulations around a combination of both. The "Interaction Matrix" is where I build rules. Since many of my clients are catalogers, folks who execute mail/holdout tests, I get access to some juicy information! In the mail/holdout tests (for both catalogs and for email), I can identify what happens if marketing is discontinued. This allows me to estimate the importance of support channels, like paid search. 50% of all paid search volume disappears if catalogs are discontinued. 25% of all paid search volume disappears if emails are discontinued. 50% of all paid search volume is "dark matter" - unmeasured - but shows up in retail purchases. I enter these factors into my "Interaction Matrix". This allows me to see what happens to the overall business if I ramp-up catalog marketing or email marketing, for instance. On a last-click basis, we see that the increase in the catalog budget and email budget resulted in more paid search last-click demand. We can also see that the paid search budget increased significantly, without interaction on our behalf. In other words, by sending out more catalogs, and by sending out more email campaigns, we drive more customers to Google (which both Google and Amazon heartily endorse). Among the customers not lost to the dark matter of the e-commerce world, we generate more paid search demand, reflected in this simulation. This is why I like focusing on Attribution Simulations. I get to see how all of these different "omnichannel" marketing strategies interact and play out over the next five years. I'm pretty confident you'd like to have a tool like this, at your disposal, as well. A definition of "clarity" is "clearness of thought or style, lucidity". MineThatData is nearly seven years old ... the blog, nearly eight years old. If you go back and read the old stuff, you'll see a lot of disjointed thoughts, random observations, and an overall lack of clarity. Time, experience, practice, and 100+ clients providing data help one achieve clarity. That's Judy, Jennifer, and Jasmine for those of you who are not familiar with my content. The pieces started to fit together. I analyzed a Judy-centric business that, if you stopped mailing catalogs, would cease to exist. And social media was meaningless, to boot. I analyzed a Jennifer-centric business that, if you stopped mailing catalogs, would barely notice the difference. I lived this experience at Nordstrom, too - and it was fascinating how many experts told me that my experiences "didn't count". Funny - I experienced a Jennifer-focused transition, but my experiences "didn't count" according to some who did not have a comparable experience. A Jasmine-centric business leader shared that 50% of traffic came from Facebook and Twitter, and now generates 35%+ of traffic from mobile. A ton of client data validates generational observations. It became clear why a cataloger in Vermont couldn't possibly hope to "pivot" to a social/mobile model. It became clear that print was utterly irrelevant to Jasmine, when she could obtain every single piece of information ever digitized for under $3 a day on a magic device held in her hand. And it became obvious that Amazon put a moat around Jennifer, and in the process, captured more than 25% of e-commerce. We're not going to be able to reverse these trends. At a conference in 2012, a representative of the USPS asked me, "how do we train Jasmine to love direct mail?" We won't train Jasmine to love direct mail. Jasmine will train us about what the future holds. And she holds the future ... in her hand, using a five inch screen. That's what lead me toward Merchandise Forensics. How the heck do you sell anything on a five inch screen? Next thing you know, 18 of 22 Merchandise Forensics projects illustrate the impact that email marketing, and paid search, and social, and mobile have on the merchandise assortment. It's not positive. Catalogs expand the merchandise assortment. Your home page expands the merchandise assortment. Email marketing contracts the merchandise assortment. Paid Search contracts the merchandise assortment. Social Media contracts the merchandise assortment. Mobile dramatically constrains the merchandise assortment. The economy caused folks to contract the merchandise assortment - fewer pages circulated - best sellers featured in marketing campaigns. Too few new items were offered, and even fewer became best sellers. In catalog marketing, this dynamic interacted with the best practice of using co-ops for customer acquisition activities, yielding older Baby Boomers buying best sellers that are attractive to older Baby Boomers. The dynamic resulted in an old customer base that liked fewer products, preferring products that appealed to older customers, rapidly aging catalog brands. Not good, and almost nobody will talk about the issue publicly. Catalogers can expect -2% to -3% merchandise productivity, per year, should the customer continue to age at the rate of the past decade. This self-fulfilling prophesy is leading catalogers to a cliff that the USPS is going to help push catalogers over. Catalogers now have two choices. Both are painful. Ride the Baby Boomer generation into retirement, generate a ton of five-year profit, but grow increasingly frustrated with declining merchandise productivity and increased USPS costs. Pivot to a younger customer, using marketing tactics and a merchandise assortment not friendly to catalog marketers, losing a ton of profit during the transition (maybe losing too much profit). It's going to be hard to pivot to a younger customer. Amazon and retailers are putting a moat around urban customers, with free same-day delivery and the lowest possible prices both coming in the short-term. And it's going to be hard to sell on mobile devices. Five inches. Mobile is not e-commerce. E-commerce is about selling everything. Mobile is about filtering everything out. E-commerce and Mobile selling skills are not complementary - not even close. A generation of e-commerce gurus face two challenges. How to sell on a small, limited device (five inches), when two decades have been spent figuring out how to sell on a large screen with an unlimited assortment? How to appeal to Jasmine, when two decades have been spent learning how to appeal to Jennifer? And retailers face comparable challenges. Why should a customer get in a car, and drive twenty minutes to a mall-based location when every piece of worldly information has been digitized, and is available on a mobile device for under $3 a day? How does a retailer, desperate to maintain store comps, stay afloat when everybody is offering ginormous discounts and promotions to capture an ever-decreasing amount of retail traffic? And why buy from a physical store when Amazon will eventually get you merchandise in hours? Catalogers get to pick their poison. E-commerce folks, who grew by cutting Jennifer out of catalog businesses, are now about to be locked-out by mobile/social, channels that appeal to Jasmine. By the way, if you tell an e-commerce leader this observation, they'll spit in your face! Not literally, of course. But they don't see it the same way outsiders see it. Retail is at a major inflection point - with no proof that digitizing the entire in-store experience results in anything other than keeping the ship afloat, at best. Once you have clarity, once you realize (by analyzing data) that generational differences are driving channel use, once you realize that demographics and channels and new merchandise introductions are significantly impacting merchandise productivity, then you have a road map to guide you into the future. Contact me (kevinh@minethatdata.com) for an analysis that allows you to understand your road map into the future. Canada Post is struggling (click here). Heck, they're going to stop delivering to homes (click here). I drove to my local post office yesterday. Outside the front door were four individuals, probably in their 60s or 70s, either waiting in line, or having survived a long wait to send gifts to family members and friends. June and Judy. 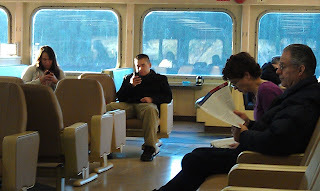 No smart phones in hand. We simply cannot ask Jasmine to continue Judy's traditions. Not when Jasmine has every piece of information ever created, digitized, in her hand, available at 20mbps for between two and three dollars a day. Remember - catalogs have been scaled back, 45% in the past six years (click here). A combination of demographics and technology are transforming our industry. Canada Post prepares us for the realization that, in the United States, we, too, may not have an affordable delivery mechanism for catalogs in the mid-term. It's time to prepare for what I call "Catalog 2020" - a business plan that leads us to a viable future - one that caters to a 67 year old customer in 2020 - or one that caters to Jennifer / Jasmine. We're going to have to make a choice. We'll need to make this choice before Canada Post or USPS make it for us. Attribution: What Happens If You Terminate Your Email Marketing Program? Too often, I sit in meetings where business leaders ask very simple questions of the marketing team. And too often, the marketing team cannot answer simple questions. Here's our business from yesterday. Let's pretend that the Executive Team is not "giving the love" to the email marketing team. Yup, happens all the time. What we don't ever get to see is what happens when email marketing is stopped. I zero out the email marketing line, for each of the next five years, in my Attribution Simulation. Here's the outcome, and it isn't pretty, folks. The Attribution Simulation shows us that email costs us +/- ten million dollars in the first year. However, by not offering email marketing, we do not reactivate or activate as many customers. We cut back on new customers. The result is a long-term death spiral - the business is down to $58 million in year five, instead of $81 million. In other words, email marketing has a $10 million dollar short-term impact, and a compounding impact over the next five years of up to $13 million additional volume. 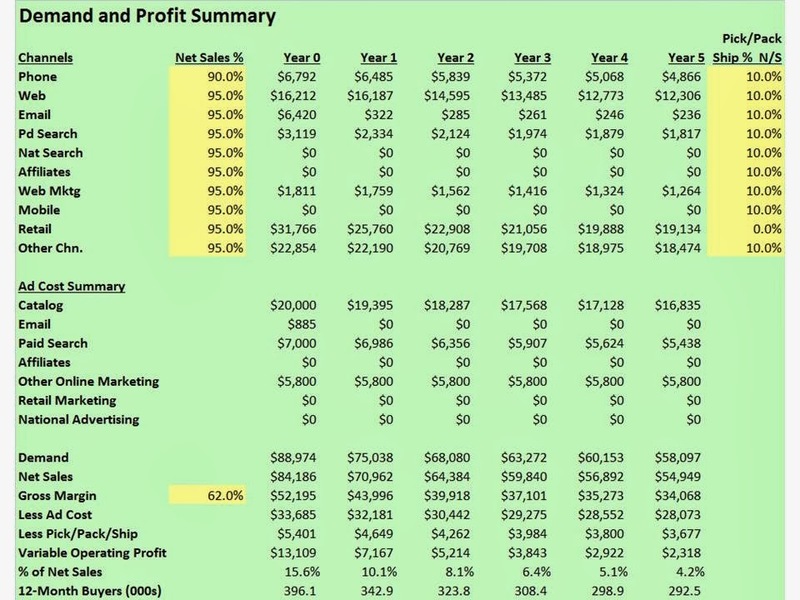 And take a look at profitability - it's virtually gone from this business, isn't it? Now, if you are the email marketing Director, wouldn't you like to have this Attribution Simulation in your back pocket? Heck, over time, you're responsible for almost all of the profit generated by this business. This is the power of the Attribution Simulation. Contact me (kevinh@minethatdata.com) for your own Attribution Simulation. From time to time, I'm asked questions like "why do retailers insist on spamming us with daily email campaigns?" First, there is essentially no cost to email marketing. Oh, I know, you're going to howl at me about how you have staff and how you pay your vendor a fortune (and you do). But once you bury those fixed costs, the cost to send one incremental campaign is as close to zero as anything in marketing not called social media. Pretend you are CEO of the company featured above. Your business is forecast to drop, year after year after year. Your job is to fix this problem. Fixing the merchandise assortment might take 1-3 years. You don't have that kind of time. Interesting, don't you think? The drop in business volume isn't so severe, anymore. Profit improves marginally. Heck, retail sales increase by 2% a year, and you barely had to do a thing make it happen ... do you know how hard it is to grow retail comp store sales by 2%? Hint - it's really, really hard! When you have a low variable cost channel like email marketing, and you have to drive customers into retail stores, you're going to need to send an awful lot of email campaigns to customers. When I run attribution simulations, I make sure I thoroughly understand how the business could grow with minimal expense and effort. Email is one of the channels that gains priority. Tomorrow, I'll show you what happens to this business when email marketing is discontinued. This Christmas represents a major change in how our peers are shipping merchandise to us. Nearly every free shipping offer I've accepted has been received in between ten and fourteen days ... ground shipping, folks. The goal, of course, is to demand that customers pay something for shipping, so that our peers make profit on a 30% off plus free shipping promotion. We've been through several shipping cycles in the past decade. Amazon gives free shipping on orders > $25, gets you merchandise in 3-5 days. We charge $14.95 for shipping, we get you merchandise in a week. Customers pay Amazon $79 a year for 2 day shipping. We offer free shipping, we get you merchandise in five days. We took a bath, from a profit standpoint, meanwhile, customers loved pre-paying Amazon $79 for 2 day shipping. Amazon partners with the USPS to get large market customers exclusive delivery of merchandise on Sunday. We partner with UPS / FedEx on free ground shipping that arrives in nine business days - which, as it turns out, is nearly two weeks of real days. If you want it fast, pay $14.95. In other words, businesses are almost taunting customers ... if you want it free, be prepared to wait ... forever. There are two trends that are worth thinking about. The service disconnect between urban and rural customers is exploding. If you live in urban Los Angeles, Amazon and just about any retail brand will jump through hoops to get something to you immediately. If you live in Burlington, Vermont, well, your service level isn't the same, is it? Sounds like a business opportunity for catalogers. Hmmmm. Will free, two-week shipping anger customers? Maybe not yet. But in time, a customer is going to ask how a retail brand can offer an urban customer same-day shipping (free) when a catalog brand takes nine business days to get the customer something for free? This is one of those major bifurcation points ... in a world where shipping gets exponentially faster and cheaper, our industry decides to slow shipping way, way, way down, unless the customer offers $$$, in which case, merchandise is still delivered slower than Amazon but faster than nine business days. The customer will decide if this is a smart way to generate profit. What do you think will happen? Join Me In London On February 20 For Vircomm Summit 2014! Are you going to be in London on February 20? If so, why not come hear me speak about ... wait for it ... wait for it ... SOCIAL MEDIA! Join me at Vircomm Summit 2014 in London on February 20 (click here). The day begins with a keynote from Kevin Hillstrom, revered analytics expert and a ferocious critic of much of what passes for best practice in our profession. Kevin will be tearing down sacred cows of community building with some much needed perspective and executive-level insight. Kevin will explain the common mistakes and myths about social media/online communities and highlight the specific circumstances in which communities can help organizations. This includes how to definitively prove that communities generate a positive return on investment. Kevin will also cover the process of building internal support for communities and gaining buy-in for a community effort. What does your boss (and your colleagues) want to hear? We’ll learn it’s not as simple as you might imagine. The talk will conclude with a series of specific action points both those at the executive level and practitioner level can immediately apply to achieve greater success. So be there! Come on! And if you are a cataloger in the UK, start your project today, so that it will be all wrapped up by the time I arrive (click here for file layouts and pricing). I have a soft spot for Lands' End. A major soft spot. I worked there from 1990 - 1995, first as a statistical analyst, later as Manager of Analytical Services. I participated in #bigdata two decades before being a "Data Scientist" was cool. So this article (click here) struck a nerve with me. 1993 = $1,000,000,000 sales, $100,000,000 profit ... profit = 10% of sales, +/-, no discounting. 2008 = $1,700,000,000 sales, $135,000,000 profit ... profit = 8% of sales. 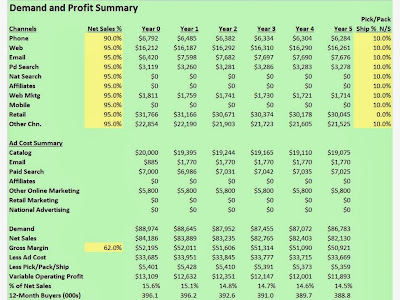 2013 = $1,600,000,000 sales, $50,000,000 profit ... profit = 3% of sales, rampant discounting. 18% of sales happen in Sears stores. The data clearly demonstrate that discounts and promotions are a response to a business that now lacks merchandise productivity. The discounts transformed the profit and loss statement. The data clearly demonstrate that multi-channel / omnichannel frameworks are hopelessly flawed. Ignoring your bias against Sears, wouldn't a catalog business with a strong e-commerce presence and a store-in-a-store concept within a mega-brand coupled with enormous discounts/promotions greatly outperform the competition? That's what we've been lead to believe. What do we do as the core Baby Boomer shopper approaches retirement age? While appealing to a core Baby Boomer audience, how do we pivot to a Jennifer/Jasmine audience? We cannot financially manufacture an answer to the two questions above. We need a combination of demographic strategy and merchandise productivity. My former company appears to lack both. Given the success of the blog post (click here), I assembled a brief presentation that allows you, the Executive, to have frank and honest discussions about where your business is headed in 2014. Here's the presentation, via SlideShare. We read that Black Friday - Sunday was not good, in spite of the deepest discounts we've ever seen (70% off nearly the entire store at JCP on Black Friday, for instance), and in spite of opening on Thanksgiving night instead of Friday morning. Then we read that Cyber Monday hit an "all time record" (like that's hard to do). We read that omnichannel is the secret to great retail performance, and yet, we seldom if ever see retailers posting great performance anymore. Don't you think that if omnichannel was so darn powerful that we'd combine omnichannel with deep discounts and see the greatest performance in the history of retail? We read that mobile is the future, and when we look around, it's easy to see proof that mobile is the future. Issue #1: E-commerce is about to be "cut off from the bottom". In other words, as Jasmine earns buying power, she's going to pick mobile-enabled businesses that fit her lifestyle. 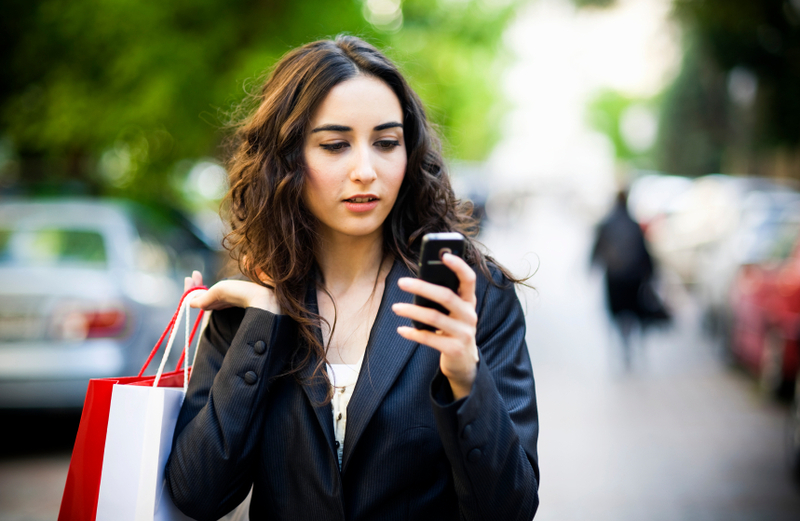 E-commerce folks will tell you that mobile and e-commerce are the same thing. They are not. Mobile is all about limiting the assortment for your specific needs at a specific point in time ... e-commerce is all about a large assortment that the customer searches through. Issue #2: E-commerce is about to be "cut off by Amazon". Do you realize that 25%+ of e-commerce funnels through Amazon? As Amazon mulched e-commerce, e-commerce mulched catalogs, with the net being a gain for both Amazon and e-commerce. The mulching of catalogers is over. E-commerce, to grow, must either mulch retail, or must mulch Amazon. Which outcome is more likely to happen? We're essentially in a zero-sum environment, so demand gains have to come at the expense of others. Issue #3: Retail (branded product available anywhere/everywhere) is about to be "cut off by Amazon", and to be "impacted by mobile". If you have proprietary product, Amazon isn't as big a deal. If you sell what Amazon sells, God help you. In response, retailers are going "omnichannel". Good luck. The solution to selling the same stuff Amazon sells is not to sell it at comparable or more expensive prices in any channel. We all know this. But since we don't have an answer, we leverage omnichannel as our version of hope. Hope is not a strategy. And by the way, if you are Orange Julius or any other mall-based business that is essentially the parasite on a mall-based host (like Macy's), how excited are you about mall-based stores promoting online business over in-store traffic? A mall-based digital distribution center solution doesn't solve problems for in-store businesses that require mall-based traffic. Amazon, and the predictable omnichannel response, do not help most of the stores in a mall. Think about what happens to a mall in five years with a subsequent 20% traffic hit? Issue #4: Given how serious the retail condition is, given how critical in-store traffic is to cover debt loads, retail will continue to discount heavily. This will cause all sorts of short-term benefits and long-term problems. If you're a 5% pre-tax profit retailer or worse, God help you. Weak retailers without 20% e-commerce year-over-year infusions will really, really suffer as the discounting accelerates. The discounts represent a thinning of the retail herd. Issue #5: Demographics are reshaping commerce. Nobody talks about it. Everybody should talk about it. Demographics manifest themselves via channels ... catalogs are owned by Judy ... e-commerce and Amazon are the realm of Jennifer ... and mobile is owned by Jasmine. Yes, I get it, your Grandmother plays Candy Crush on a tablet, fine. I'm more interested in how Jasmine and Forever 21 interact on a phone, because that's the future, folks. And in ten years, a decade of mobile, retail and Jennifer will yield a version of retail we cannot envision today. Business is going to be transformed by a morphing of demographics and technology. Issue #6: Service. Are you a rural customer ordering from your favorite "brand" after using a free shipping promotion? My condolences, because your product will arrive in ten days. Meanwhile, if you live in an urban area, the trend is moving to same-day (and eventually, same-hour) shipping. Urban Jasmine is going to be fundamentally transformed by this level of service, all available on her phone. Look out. Meanwhile, the rural customer with 3mbps internet access is basically living in the 1990s. Issue #7: Vendors. They're trying to survive, just like you. Ask the USPS - they're going to extract as many pennies from catalogers as possible, to stay alive, while stabbing you in the back by giving Amazon exclusive Sunday product delivery. You fund the present so that the USPS can find their future. The co-ops are integrating your offline transactions with social media to yield "big data". You are going to be used your vendors in an effort to fund their future. They realize that cataloging is not the future, they just don't want to tell you what they think, they'd rather you fund their future. Pay attention to vendors who "have your back". Issue #8: Real Estate. In 1974, catalogers issued 600 page catalogs. In 1994, targeted 124 page catalogs were the norm. In 2014, e-commerce and unlimited assortments rule. Mobile is going to take us back to 1994. There's simply no real estate available in mobile. This will cause there to be merchandise winners and merchandise losers. Somehow, e-commerce folks who have been trained to "make everything available" to the customer must learn how to "make only that which is relevant to each individual customer" - personalized, targeted, relevant. It will take five years for folks to get to a reasonable outcome - a lot of trial, error, and lost profit. Almost nobody wants to talk about this, by the way, because it is truly problematic from a selling standpoint - check your mobile conversion rates for confirmation. Issue #9: Distractions. Big Data. Social Media. Omnichannel. All of this is a distraction. Now, is Big Data real? Maybe. But so what? 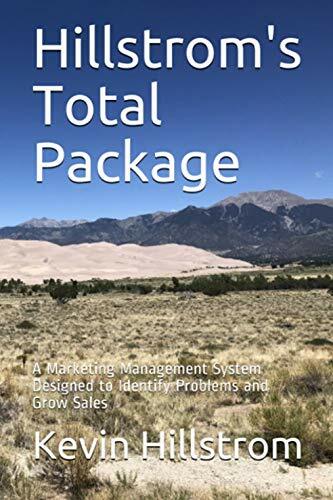 Of what possible good is it to target the right customer with the right promotion at the right time if what you are selling is available on Amazon at the same price and they're going to deliver it free within 48 hours and you can't do that? And trust me, customers don't want to "engage" with brands, they don't want to have "conversations" with brands. Customers want what they want, and if a conversation is part of getting what they want, they'll tolerate it. Every one of us has to filter out noise, and focus on what matters. 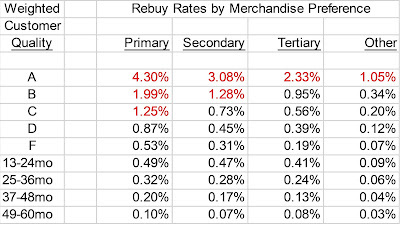 For so many of us, we have 40% annual repurchase rates, and if the customer repurchases, they buy 2 times a year. These metrics improve when customers like our merchandise, they sink when customers don't like our merchandise. It's that simple. We're going to have to get much, much better at filtering out the noise. Issue #10: Merchandise. If there's ever been a #fail in marketing, it's the trend in merchandising in the past five years. Go spend a half-hour with your marketing team, and find out just how bankrupt they are when it comes to understanding merchandising strategies. Marketing productivity stinks, for the most part, because the merchandising team is messing up. And then, our friends, the marketers, compound the problem. They send customers to landing pages with clearance product, and then brag when conversion rates increase (not my fault, I'm driving traffic to the site). In fact, ask anybody in your company how many new items were introduced in 2013, and how that number compares to the past five years?! You're lucky if 1 in 100 can provide you with an answer to this most basic of questions. Your marketing team should be beating the living daylights out of your merchandising team. They should demand highly productive items to feature in email, on landing pages, in the first twenty pages of a catalog, in social media (instead of engaging customers, why not sell customers something). In 2014, demand that 20% of the time your marketing team spends working on issues is spent working on understanding what sells, and what does not sell. All businesses are dealing with the ten issues above - acting chaotically in the short term. 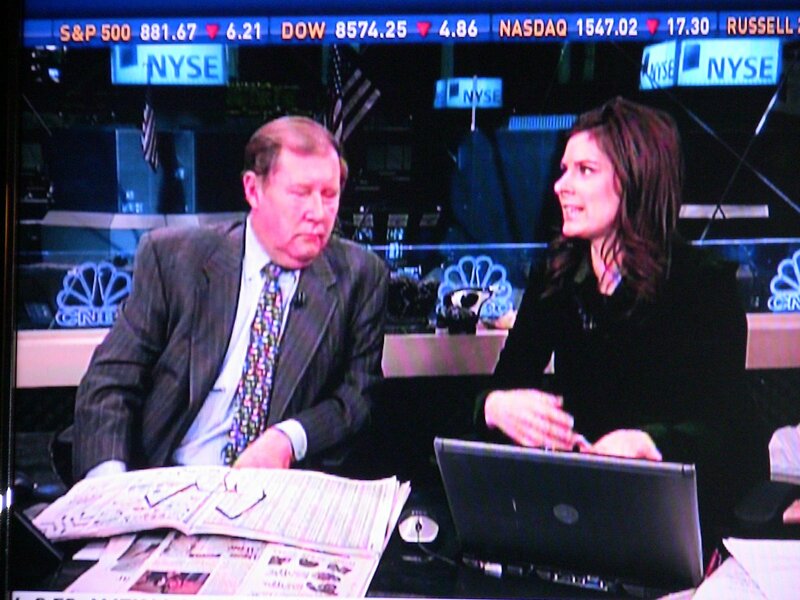 Remember the internet bubble? That era represented smart people acting chaotically. Here we go again. All of this will make sense in five years, when Jasmine becomes the customer and mobile is the delivery mechanism. 2014 is the year you get to start choosing your future. Prior to 2014, catalogers were told to be "multi-channel". And we listened. Big mistake. Starting in 2014, we get to evaluate the seven issues outlined above, charting our own course. 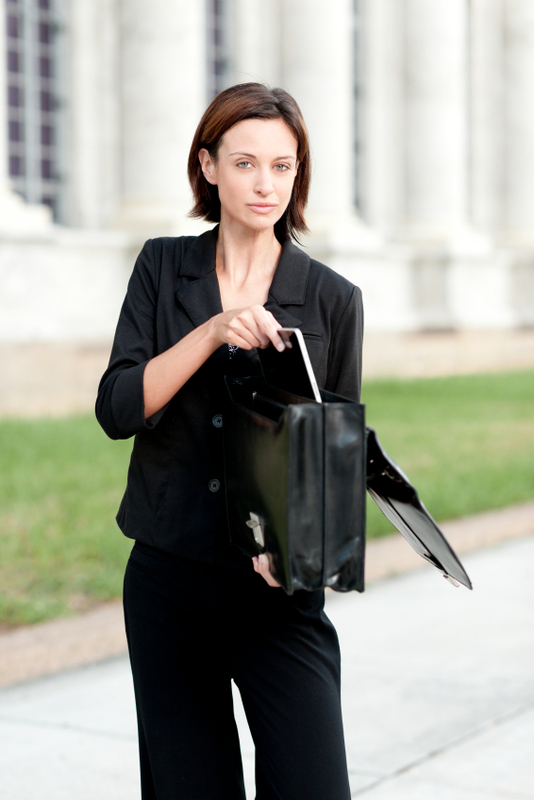 In early 2014, you'll have Executive planning meetings. These eight issues should be discussed, by you, and by your Executive Team. Let me know if you need help. GREATEST ... PROMOTION ... EVER! Courtesy of @kstraw, I present you with the GREATEST ... PROMOTION ... EVER! Click here to be thoroughly immersed in Black Friday promotional goodness. The next time somebody gives you the whole "we have no choice but to heavily discount in order to remain competitive during these difficult economic times" argument, please share this BEST PRACTICE. Here's a typical Attribution challenge. Maybe you're spending a lot of money on Paid Search. Your Attribution vendor suggests you're overpaying, significantly overpaying for many keywords. So you cut back on spend. You've just "optimized" your business. Good for you! And then, nine months later, your business is plowing through +2% gains to last year, when you expected +6% gains to last year. Management is upset. Nobody knows why business is not meeting expectations, all anybody knows is that something is just a little bit off. Here's something that is not well understood about Attribution. When you optimize based on past results, you do not factor in future performance. As a result, future performance is not optimized. Here's an example - you have a customer with a 40% chance of purchasing again next year. But you are significantly overspending in Paid Search - so you back off numerous terms. For this individual customer, maybe one who likes Paid Search, the repurchase rate changes ... it was 40%, maybe now it is 30%. If the customer has a 30% chance of purchasing, instead of 40%, then the customer will obviously spend less - and will spend less across the channels the customer prefers (maybe affiliates, maybe email) - since paid search closes sales generated in other channels. In other words, email productivity may suffer because the customer is less active. Well, it will suffer. I've run a lot of downstream simulations, and that's what I observe. In other words, the optimization of short-term results via Attribution leads to the sub-optimization of the business in the long-term. This is a problem that needs a solution. In upcoming posts, we'll talk about the solution. Attribution is terribly important these days, don't you think? From the inaccurate and simplistic matchbacks that revolutionized the catalog industry ten years ago to the multi-touch models that incorporate social/mobile activities, we're almost forced to employ some sort of Attribution model in our results analytics. An Attribution model provides an estimate of the impact each advertising channel had on an order. If a customer purchased after touching catalog - email - email - social - affiliate, we don't want to give all credit to the catalog (matchbacks), or all credit to the affiliate (last touch). Both methods are wrong. In fact, every Attribution methodology is wrong. And that's ok. We simply cannot crawl inside the head of a shopper in Upstate New York and divine exactly why a purchase happened. Everybody has to make a guess at some point, everybody has to infer just how effective each marketing channel is. There is a piece of the Attribution puzzle that is missing. It's the forward-looking piece. Attribution has a serious limitation. You look backwards, and you make a guess as to whether marketing activities were profitable or not. Not many folks "do the opposite" ... not many folks look forward, and estimate how the future of the business changes as you make changes to the advertising budget. In upcoming weeks, we'll explore a "future" view of Attribution - combining the work of your favorite Attribution vendor with a five year estimate of demand/profit given different marketing investments. Come along for the ride, ok?! I'm frequently asked for project endorsements. And for obvious reasons, clients want to keep their results as secret as possible. However, the kind folks at Dancewear Solutions (click here) were willing to provide an endorsement. If you're thinking about a project, and just want to know that somebody else had a good experience, then read this statement from Claudia Reed, SVP of Marketing at Dancewear Solutions. Thanks, Claudia! 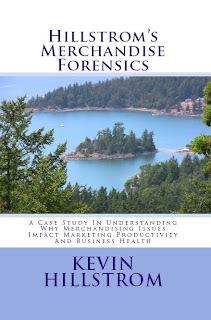 We engaged multi-channel marketing expert, Kevin Hillstrom, to conduct his Catalog PhD on our direct marketing program. We are so thankful we did! At a high level, he was able to better define our business and the type of direct marketing that makes sense for our very young, web-centric customer base. On a more granular level, he was able to help us refine (or in some cases overhaul) our strategies and set budgets for various segments. Kevin began by diving into four years of transactional and other data (including dropped cookie data from online shoppers) to provide excellent guidance for better leveraging our best customers and enhancing our DM-decision making for fringe customers. The dropped cookie data gave insight into the value of customers obtained through various acquisition strategies (i.e. Google paid search, Bing organic, direct, social, etc.). Kevin was also able to lend confidence to our mail hold-out test findings by aligning our results with his own extensive corporate and client research. With his analysis complete, Kevin delivered scoring algorithms that allowed us to grade our existing customers A – F, as well as all new customers to file to help guide our future circulation efforts. We’ve followed Kevin's prescription for mailing our most (and least) active customers, and we couldn’t be happier with the results. Cutting unnecessary circulation and shifting some of those dollars into new budget-friendly formats for our best customers allowed us to see a return on this investment with the first mailing! We’ll gladly be hiring Kevin again for future projects. Ok, I'm just getting this out of the way right now - somebody is going to call Cyber Monday "Mobile Monday" real soon ... suggesting that with anywhere between 3% and 50% of Cyber Monday orders happening on mobile devices that this "CHANGES EVERYTHING" and that "SAVVY BRANDS CAN REAP THE REWARDS WITH DEEP DISCOUNTS ON MOBILE MONDAY". My readership, by the way, hit an annual high on Cyber Monday. A lot of feedback in my email inbox. "Engagement" on Twitter. And more than anything, a ton of referring URLs to the blog from Facebook, something that NEVER happens. Dear Catalog CEOs: The Nonsense Of Cyber Monday. Measuring The Wrong Stuff - Cyber Monday Demand vs. Cyber Monday Profit. We learned a lot this weekend, didn't we? The time between Thanksgiving and Christmas is compressed this year (that only impacts the entire season, not Black Friday - Cyber Monday). By the way - by opening stores on Thanksgiving instead of Black Friday, we caused overall sales to decline. Ponder that one for a moment, the next time you want to ruin Thanksgiving for your employees by forcing them to work. We've never seen discounts like this year, have we? A favorite, mega-brand apparel retailer blew through 40% off, then 50% off, then 40% off, then 50% off. Not off clearance, mind you, off NORMAL MERCHANDISE. How do you ever recover from offering 50% off normal merchandise? Please explain why a loyal customer should ever pay full price in October or November again? Just wait until Black Friday / Cyber Monday / Mobile Monday, right? According to NPR (click here), the response to a soft weekend will be ... wait for it ... wait for it ... DEEPER DISCOUNTS!! My retail clients and readers have been brainwashed by folks with no skin in the game. In the short-term, deeper discounts are required to move inventory, so yes, I get why we respond to a failure to sell stuff at 40% off by offering 50% off. Maybe, however, we've hit a tipping point in the whole discounting / omnichannel movement. Short of giving away merchandise all weekend, you can increase demand by going from full price to 10% off. You can increase demand by going from 10% off to 20% off. You can increase demand by going from 20% off to 30% off. And then something curious happens. The rate that you increase customer response begins to slow as the discount rate gets higher and higher. The number of units the customer buys plateaus. The combination of customer response and unit purchases results in a demand plateau (and a profitability bath). In other words, you need a dramatic increase in response once you start moving past 30% off, in order to offset the horrific impact that %-off promos have on unit volume and profitability. And if response does not increase linearly, well, then you have this year's Black Friday - Cyber Monday event. Oh, I can hear the grumbling already. "We had to discount to remain competitive in this difficult marketplace". Hogwash. Just stop it already! Why did you not care about being competitive on October 22? Or June 7? Or April 14? You could have discounted on those days and crushed the competition (think Nordstrom's Anniversary Sale, for a great example of discounting at a non-competitive time). And did you walk into an Apple store on Black Friday? How much were those iPads being discounted? 30%? How the heck did Apple move volume on Black Friday? Discuss among yourselves. And if your answer is "they have a great brand and merchandise customers want", then holy cow, maybe you've hit on the reason why you have to discount so heavily. The discounts are too deep, and no longer attract audience increases. Trust is shot. Why should a customer pay anything other than the lowest possible price? Omnichannel doesn't pay off. If it did, wouldn't all of the digital wonkery result in attracting customers who get in the car and shop in the store at increased rates, not decreased rates? Shouldn't all of the omnichannel solutions we've been hearing about, coupled with deep discounts, resulted in dramatic increases in sales? The only folks who benefited were the trade journalists. They got eyeballs and media attention ... and that attracts ad dollars (usually from vendors who wish to advertise, vendors you hire ... so it's ultimately YOUR money that is being funneled to the trade journalists hyping deep discounts, omnichannel, Black Friday, Cyber Monday, and Mobile Monday). We have arrived at a tipping point. We can continue to worship vapid technological solutions (omnichannel) while Amazon builds delivery drones (customer service > omnichannel). We can continue to worship discounts and promotions when we don't have an original idea left to promote our business. We can continue to believe that mobile will add sales (instead of the much more likely outcome that it will heavily cannibalize in-store sales and e-commerce). Or we can get back to the basics. Brilliant merchandising. Storytelling. Outstanding customer service. I dare you to find any expert in the trade journals who talk about how a combination of merchandising, storytelling, and customer service yield positive results. It's completely ignored. And it is time to change the narrative. What we're doing is not working. Please leave a comment with your thoughts. Or send me an e-mail message (kevinh@minethatdata.com) with your thoughts. Instead of measuring sales and cheering the results, why not measure profit? How many of you #measure profit? Be honest! 2009 = $1,000,000 demand, 60% gross margin, average discount = 10%. 2010 = $1,300,000 demand, 60% gross margin, average discount = 12%. 2011 = $1,700,000 demand, 60% gross margin, average discount = 16%. 2012 = $2,300,000 demand, 60% gross margin, average discount = 22%. 2013 = $3,000,000 demand, 60% gross margin, average discount = 29%. Now, your favorite trade journalist will cheerlead the fact that you generated a 30% increase in demand on Cyber Monday (IT WAS A RECORD DAY, AND BRANDS REAPED THE REWARDS). I'll bet the CFO stops by the office of the CMO and swats him/her over the head with a rolled-up newspaper. This is the real story of Cyber Monday. It happens all the time, all across the country. If you need help evaluating your Cyber Monday effectiveness, contact me now (kevinh@minethatdata.com).